Darnold is excited to work with new head coach Adam Gase, Al Iannazzone of Newsday reports. "I think the stuff that coach Gase does is amazing," Darnold said. "The scheme that he's able to create and to be able to put the defense in uncomfortable positions, which he does a lot, I think it is awesome and shows a lot about his creativity and his offensive mind." 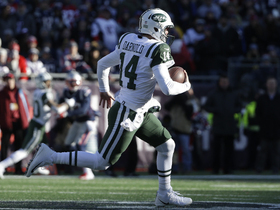 Darnold completed 16 of 28 passes for 167 yards while adding a 28-yard carry and losing a fumble in Sunday's 38-3 loss to New England. He finishes the season with 2,865 passing yards and a 17:15 touchdown to interception ratio. Analysis: Darnold ends his up-and-down rookie season on a down note, though the 28-yard rush was the longest of his career. He should undoubtedly return as the Jets' starting quarterback next season, and the team has oodles of cap space and a high draft pick to surround Darnold with more talent, as the poor play around him noticeably took a toll on the third overall pick's numbers. Darnold completed 24 of 35 passes for 341 yards and three touchdowns while rushing three times for four yards in Sunday's 44-38 overtime loss to the Packers. Darnold completed 24 of 38 passes for 253 yards and two touchdowns while rushing six times for 35 yards in Saturday's 29-22 loss to the Texans. Darnold (foot) was a full participant in Tuesday's practice, Darryl Slater of NJ.com reports. Darnold (foot) and coach Todd Bowles both expect the quarterback to be fine for Saturday's game against the Texans, Rich Cimini of ESPN.com reports. Analysis: Bowles said the injury to Darnold's right foot is different from the issue that caused a three-game absence, but it's hard to imagine they aren't related in any way. Regardless, the rookie missed just one drive during Sunday's game in Buffalo, ultimately leading the Jets to 14 points in the fourth quarter to secure a 27-23 win. While he doesn't expect to miss any more time, Darnold likely will have a spot on the team's Week 15 injury report. Darnold completed 16 of 24 passes for 170 yards, a touchdown and an interception in Sunday's 27-23 win over Buffalo. He also rushed for 10 yards on four carries. Darnold returned to Sunday's game against the Bills after initially exiting with a right foot injury, Andy Vasquez of The Bergen Record reports. Analysis: Darnold, who is playing for the first time since Week 9, presumably aggravated his sprained foot on the Jets' opening drive. Josh McCown stepped in for the subsequent possession and led the Jets into field-goal range, but it looks like Darnold will be ready to go for the rest of the day after receiving some treatment on the sideline. Darnold is questionable to return to Sunday's game in Buffalo due to a foot injury. Analysis: Darnold missed the Jets' previous three games due to a sprained right foot, so he may have aggravated the injury. While there's a chance he may reenter the contest, he'll yield quarterback duties to veteran Josh McCown for the time being. Darnold (undisclosed) limped to the locker room during the first quarter of Sunday's game at Buffalo, Brian Costello of the New York Post reports. Analysis: After missing three contests with a sprained right foot, Darnold was cleared to return Sunday, only to last nine minutes before suffering a lower-body injury. 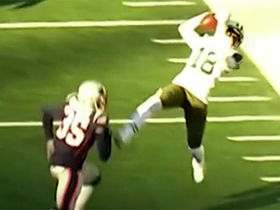 It remains to be seen if his right foot is the culprit, but the Jets will confirm the nature of the injury in short order. Darnold (foot) will return from a three-game absence to start Sunday's game against the Bills, a source told Brian Costello of the New York Post. Darnold (foot) was a full practice participant Friday and doesn't have any injury designation for Sunday's game in Buffalo, Greg Joyce of the New York Post reports. Analysis: A full participant at every practice this week, Darnold is expected to return to the starting job Sunday, though coach Todd Bowles has thus far declined to provide confirmation. Given how poorly Josh McCown played the past three weeks, there isn't much reason to keep Darnold on the bench. It isn't clear whether Bowles is making a poor attempt at gamesmanship or if he truly remains undecided on his Week 14 starter. Darnold was a full participant in practice Thursday for the second consecutive day, but coach Todd Bowles was unwilling to confirm the rookie as the team's starting quarterback for Sunday's game against the Bills, Connor Hughes of The Athletic reports. Darnold (foot) practiced fully Wednesday, Rich Cimini of ESPN.com reports. Analysis: As has been reported previously, Darnold -- who has missed three games with a strained foot -- is in line return to action Sunday against the Bills, barring any setbacks. Meanwhile, Josh McCown (back), who had been starting in Darnold's place over the past three games, logged a limited practice Wednesday. The Jets haven't officially named a starter for Week 14, but Darnold's return to practice in full capacity would make it a surprise if he was bypassed for the nod. Darnold (foot) was the first quarterback to take reps during team drills Wednesday, Rich Cimini of ESPN.com reports. Coach Todd Bowles said Darnold (foot) may be limited in practice once again Wednesday, Ethan B. Greenberg of the Jets' official site reports. Coach Todd Bowles admitted after Sunday's 26-22 loss to the Titans that Darnold has essentially healed from his sprained right foot and could be ready to start Week 14 in Buffalo, Manish Mehta of the New York Daily News reports. "He could have played. He just needed more reps," Bowles said of the rookie quarterback. "You just can't bring him back after 14-to-17 days [off]. 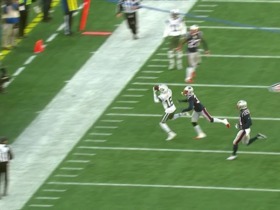 Even if he's healthy, to not have timing and everything else and put him out there [Sunday] in a game like this. We'll reload this week and see where he is." Darnold (foot) is inactive for Sunday's game against the Titans. 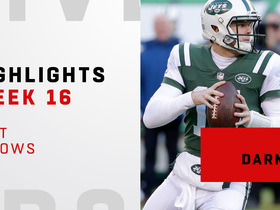 Darnold (foot) won't start Sunday's game against the Titans, sources tell Rich Cimini of ESPN.com. Josh McCown will instead fill in under center for the Jets' third consecutive game. Darnold (foot), who is listed as questionable for Sunday's game against the Jets, isn't expected to start but will go through a pregame workout before his status for the contest is determined, sources tell Ian Rapoport of NFL Network. The Jets are listing Darnold (foot) as questionable ahead of Sunday's game against the Titans, Dennis Waszak Jr. of the Associated Press reports. Darnold (foot) was listed as a limited participant in Thursday's practice, Andy Vasquez of The Bergen Record reports. Darnold (foot) is taking part in Thursday's practice, Ethan B. Greenberg of the Jets' official site reports. Darnold (foot) said he felt "really good" after a limited practice Wednesday and hopes to play in Sunday's game in Tennessee, Rich Cimini of ESPN.com reports. Analysis: Josh McCown (back/thumb) worked with the first-team offense during the open portion of Wednesday's practice, but Darnold served as the No. 2 quarterback ahead of Davis Webb. It's a sign the rookie could be active for Sunday's game against the Titans even if the Jets take a cautious approach and keep McCown under center for another week. Darnold plans to practice again Thursday, with his activity during that session -- as well as Friday's -- likely to shed further light on his status for Week 13. Darnold (foot) was a limited practice participant Wednesday, Eric Allen of the Jets' official site reports. Darnold (foot) was present for the Jets' first practice of the week Wednesday, Rich Cimini of ESPN.com reports. Analysis: That was also the case last Wednesday, but the quarterback was ultimately listed as a non-participant on the team's corresponding injury report. It remains to be seen if Darnold will be able to work in an official capacity Wednesday, but an update on that front should come later in the day. His status for Sunday's game against the Titans tentatively remains cloudy. 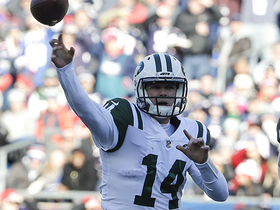 Darnold (foot), who is already listed as out for Sunday's game against the Patriots, likely will miss the Jets' Week 13 contest in Tennessee as well, sources told Ian Rapoport of NFL Network. Darnold (foot) won't play Sunday against the Patriots. Analysis: With Darnold officially ruled out, Josh McCown will draw another start at QB for the Jets this weekend. Darnold's next shot to play will arrive in Week 13, when New York faces Tennessee on the road. Darnold (foot) was once again listed as a non-participant at Thursday's practice, Darryl Slater of NJ.com reports. Analysis: While Randy Lange of the Jets' official site relays that coach Todd Bowles says it's too early to know who will start at QB for the team Sunday against the Patriots, both Slater and Manish Mehta of the New York Daily News expect that Josh McCown will get the nod. That seems like a probable outcome, with added clarity on that front due to arrive Friday. Darnold (foot) was in uniform for Wednesday's practice but was listed as a non-participant on the team's injury report, Eric Allen of the Jets' official site reports. Analysis: While Darnold is said to be making some progress from his strained right foot, his status for Sunday's game against the Patriots remains unclear. At this stage, he's not ruled out for the contest, per Manish Mehta of the New York Daily News. If Darnold ends up being held out again this weekend, Josh McCown would be in line for another start. Darnold (foot) is in uniform for Wednesday's practice, Eric Allen of the Jets' official site reports. Analysis: The Jets will reveal later Wednesday how extensively Darnold was involved in practice, but his presence on the field in any capacity is a step in the right direction. Darnold last played Nov. 4 against the Dolphins, with Josh McCown having drawn the team's Week 10 starting assignment in advance of the Jets' bye. Head coach Todd Bowles described Darnold (foot) as "day-to-day, week-to-week" at Monday's practice, Rich Cimini of ESPN.com reports. Analysis: While Bowles' comments aren't helpful in the slightest, his rookie quarterback -- who has resumed jogging on his injured right foot -- indicated he's no longer experiencing any pain and wants to play in this Sunday's game against the Patriots. We'll see if Darnold is available to practice Wednesday when the Jets issue their first injury report of the week. His participation in any capacity would bode well for his impending availability. Darnold (foot) said he has been jogging without pain, Rich Cimini of ESPN.com reports. Analysis: Darnold was held out of Monday's practice coming out of a Week 11 bye, but it does seem he made some form of progress during the time off. Josh McCown will get another start if the rookie isn't ready for Sunday's home game against the Patriots. Darnold (foot) isn't practicing Monday, Connor Hughes of The Athletic reports. Analysis: Coming out of a Week 11 bye, Darnold still isn't ready to practice as the Jets begin preparation for Sunday's game against New England. There's still time for the rookie to get some work before the contest, but the initial absence suggests Josh McCown may get another start. Darnold (foot) is out of his walking boot, but coach Todd Bowles acknowledged Monday that he isn't sure if the rookie quarterback will be ready to play after a Week 11 bye, Rich Cimini of ESPN.com reports. Darnold (foot) is inactive for Sunday's game against the Bills. Analysis: With Darnold out, Davis Webb will serve as Josh McCown's backup Sunday. Meanwhile, ESPN's Adam Schefter relays that Darnold has a sprained arch in his foot. With the Jets on bye in Week 11, it's possible that Darnold could return as soon as the team's Nov. 25 game against the Patriots, though it's also plausible that he could be held out until Week 13, with the big picture in mind. Darnold (foot) is listed as doubtful for Sunday's game against the Bills. Analysis: Rich Cimini of ESPN.com relays via coach Todd Bowles that it's "possible" Darnold could suit up as the Jets' No. 2 QB on Sunday, but a more likely scenario is that the team promotes Davis Webb from the practice squad in order to back up Josh McCown this weekend. Coach Todd Bowles said Darnold (foot) wouldn't be available to start Sunday's game against the Bills, but could still dress as the backup quarterback, Manish Mehta of the New York Daily News reports. Darnold (foot) isn't participating in Thursday's practice, Eric Allen of the Jets' official site reports. Coach Todd Bowles said Wednesday that Darnold is considered day-to-day with a foot strain. Darnold (foot) is expected to miss Sunday's game against the Bills, Brian Costello of the New York Post reports. Analysis: While the Jets haven't actually ruled Darnold out, multiple beat reporters have sources confirming he won't be able to play after sitting out Wednesday's practice while donning a protective boot over his sprained foot. Josh McCown is expected to start Sunday, with the rookie potentially gaining clearance to play following the Jets' Week 11 bye. Darnold is dealing with a sprained right foot, both Rich Cimini of ESPN.com and Manish Mehta of the New York Daily News report. Analysis: According to Mehta, Darnold's sprain is "significant," and the expectation is that quarterback won't be available Sunday against the Bills. The Jets have yet to confirm that will be the case, but those who have been relying on Darnold in fantasy leagues should begin weighing other options. If Darnold is in fact sidelined for Week 10, Josh McCown would draw the team's starting assignment. Darnold wasn't practicing Wednesday due to an apparent foot injury, Connor Hughes of The Athletic reports. Darnold completed 21 of 39 pass attempts for 229 yards and four interceptions during Sunday's 13-6 loss to the Dolphins. Darnold completed 14 of 29 passes for 153 yards and a touchdown while adding 22 yards on five carries in Sunday's 24-10 loss to the Bears. 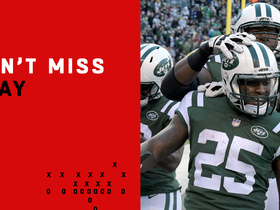 Analysis: Darnold struggled in this one, though it's hard to blame the rookie considering top wide receivers Robby Anderson and Quincy Enunwa both sat out due to ankle injuries. For the second consecutive week, the recipient of Darnold's lone touchdown pass was tight end Chris Herndon. The USC product will welcome the return of warm weather -- and hopefully some of his receiving weapons -- when the Jets travel to Miami for a clash with the rival Dolphins in Week 9. Darnold completed 17 of 42 passes for 206 yards, one touchdown and three interceptions in Sunday's 37-17 loss to the Vikings. He also rushed six times for 18 yards and a touchdown while losing one of two fumbles. Darnold completed 24 of 30 passes for 280 yards, two touchdowns and an interception during Sunday's 42-34 win over the Colts. He added eight yards on six carries. Analysis: Darnold piled it on the Colts late in the first half, finding Terrelle Pryor in traffic for a seven-yard touchdown. Darnold was without one of his favorites, Quincy Enunwa (ankle), for much of the game, but adjusted by turning to the likes of Pryor and Jermaine Kearse. After three straight games completing 50 percent or fewer of his passes, Darnold topped 62 percent for just the second time this season. He next gets a Minnesota defense on Sunday that has had its struggles defending the pass. Darnold completed 10 of 22 passes for 198 yards, three touchdowns and an interception during Sunday's 34-16 win over Denver. Darnold completed 17 of 34 passes for 167 yards and a touchdown while rushing twice for eight yards in Sunday's 31-12 loss to the Jaguars. Analysis: Darnold took care of the ball, but he failed to make much of a dent against Jacksonville's elite defense. His lone touchdown was a two-yard strike to tight end Jordan Leggett early in the fourth quarter. The rookie quarterback's still a work in progress, but he should have an easier time at home against Denver next week. Darnold completed 15 of 31 passes for 169 yards with no touchdowns and two interceptions in Thursday's 21-17 loss to the Browns. Darnold completed 25 of 41 passes for 334 yards, one touchdown and two interceptions in Sunday's 20-12 loss to Miami. He also gained one yard on two rushing attempts. Darnold completed 16 of 21 passes for 198 yards, two touchdowns and an interception in Monday night's 48-17 win over the Lions. Darnold will open the season as the Jets' starting QB. Analysis: This was expected since Teddy Bridgewater was traded to the Saints, but the Jets waited until Monday to make the word official. Josh McCown is thus in line to serve as Darnold's backup. While the rookie signal-caller has plenty of long-term upside, his initial fantasy prospects are muddled by the Jets' unsettled WR/TE situations. Coach Todd Bowles hasn't officially named a starter, but ESPN.com's Rich Cimini has no doubt Darnold will get the nod Week 1 in Detroit. Analysis: With Teddy Bridgewater traded to New Orleans on Wednesday and Josh McCown starting Thursday's preseason finale against Philadelphia, the Jets haven't exactly made an effort to hide their intention of starting Darnold. The team still hasn't actually come out and said it, but Manish Mehta of the NY Daily News and Brian Costello of the NY Post agree with Cimini that all signs point to Darnold getting the Week 1 start. Darnold appears poised to open the upcoming season as the Jets' starting quarterback, Adam Schefter of ESPN reports. Analysis: The Jets have yet to officially confirm that Darnold will be their Week 1 starter, but the rookie's claim to the top job was strengthened after Teddy Bridgewater was dealt to the Saints on Wednesday. The 39-year-old Josh McCown served as the team's primary starter under center in 2017 and performed capably in that capacity, but he seems likely to transition to a backup gig with Darnold demonstrating in practices and in exhibition play that he's ready for the No. 1 role. Darnold has "all but wrapped up the starting job", according to ESPN's Rich Cimini. Darnold completed eight of 16 passes for 86 yards with one touchdown and no interceptions in the Jets' 22-16 preseason loss to the Giants on Friday. He also rushed twice for 13 yards. Darnold likely will play the entire first half in Friday's preseason game against the Giants, Josina Anderson of ESPN reports. Darnold got the bulk of the Jets' QB reps Sunday, likely setting the stage for him to start Friday's preseason game against the Giants, Rich Cimini of ESPN.com reports. Analysis: Though the Jets have yet to tip their hand with regard to their Week 1 starter at QB, Cimini noted Sunday that the sense he gets "is that, barring regression against the Giants, (Darnold is) trending toward" earning the assignment. While veteran signal-callers Josh McCown and Teddy Bridgewater are still on hand, from the moment Darnold was taken third overall in April's draft it was only a matter of time before he gained the Jets' starting role. Even though Darnold started Thursday's preseason game against the Redskins, coach Todd Bowles continues to describe New York's quarterback competition as "cloudy," Rich Cimini of ESPN.com reports. Darnold got the start in Week 2 of the preseason Thursday in Washington, completing eight of 11 passes for 62 yards and an interception in the Jets' 15-13 loss. Darnold will start Thursday night's preseason tilt against Washington, Adam Schefter of ESPN reports. 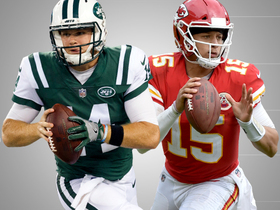 Analysis: Darnold is gaining momentum in his quest to open the regular season as the Jets' starting QB over veteran signal-callers Josh McCown and Teddy Bridgewater. Per Ian Rapoport of NFL Network, the rookie is expected to garner "extensive snaps" Thursday, which sets the stage for Darnold to carve out DFS utility this week. Darnold is "trending toward the opening-day start" at QB for the Jets, per ESPN's Rich Cimini. Analysis: That's a notion echoed by Manish Mehta of the Daily News, who states that "it'd be an upset if Darnold isn't the Week 1 starter." Darnold is expected to see plenty of action in Thursday night's preseason game against Washington and barring a regression in that contest, it may be hard to stop the momentum that the No. 3 overall pick in April's draft has built toward the goal of officially overtaking veteran signal-callers Josh McCown and Teddy Bridgewater. Darnold is expected to play extensive snaps in Thursday's preseason game against the Redskins, Ian Rapoport of NFL Network reports. For the second straight day Monday, Darnold (finger) took the bulk of the Jets' first-team QB reps at practice, Rich Cimini of ESPN.com reports. Analysis: Though coach Todd Bowles won't say who will start Thursday night's preseason game against Washington, it looks like Darnold will get the nod over Josh McCown and Teddy Bridgewater. Beyond that, as certain as it is that Darnold will eventually claim the team's starting job for the long haul, it remains to be seen if the rookie's ascent to that role will be complete by Week 1. Darnold was spotted Monday with his left ring finger wrapped, Brian Costello of the New York Post reports. Analysis: It's presumably a minor concern, stemming from the QB's hand getting stepped on during Friday's preseason game. In fact, ESPN's Rich Cimini relays that while Darnold remained third in the team's QB rotation behind Josh McCown and Teddy Bridgewater on Sunday, he took the majority of the first-team QB reps at practice, suggesting that he might start Thursday night's game against Washington. 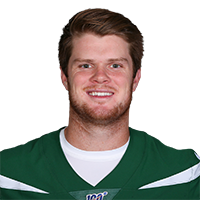 Darnold made his professional debut in Friday's 17-0 preseason win over the Falcons, completing 13 of 18 passes for 96 yards and a touchdown while adding eight yards on two scrambles. Darnold "has a very fair shot" of emerging as the Jets' starting quarterback for the regular-season opener Sept. 10 against the Lions, a source familiar with the situation informed Adam Schefter of ESPN. Darnold has ended his contract holdout, Rich Cimini of ESPN.com reports. Darnold hasn't signed a contract and won't report for training camp Tuesday with the Jets' other rookies, Ian Rapoport of NFL Network reports. Analysis: It's still a bit early for significant concern, as the Jets won't actually start practicing until Friday. Head coach Todd Bowles said in June that Darnold will enter camp as the No. 3 quarterback, starting off behind Josh McCown and Teddy Bridgewater. The rookie has time to make his move, but it won't help his case if he misses the early portion of camp. Head coach Todd Bowles said Thursday that Darnold will start training camp as the Jets' third-string quarterback, Eric Allen of the team's official site reports. 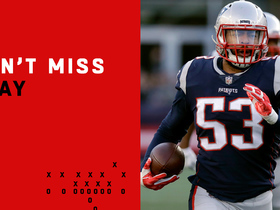 New England Patriots linebacker Kyle Van Noy scoops New York Jets quarterback Sam Darnold's fumble for HUGE TD return. New York Jets wide receiver Deontay Burnett goes UP to snag quarterback Sam Darnold's sideline pass for 22 yards. 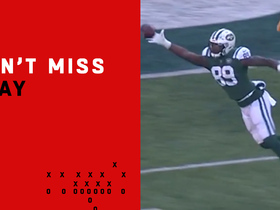 New York Jets quarterback Sam Darnold rips pass to wide receiver Deontay Burnett for impressive 25-yard sideline connection. 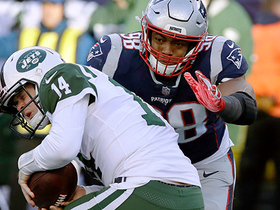 New England Patriots defensive end Trey Flowers plants New York Jets quarterback Sam Darnold for big loss on third-down sack. New York Jets quarterback Sam Darnold delivers pinpoint sideline pass to wide receiver Deontay Burnett while under heavy pressure. NFL Network's Kurt Warner reveals his top five quarterbacks from Week 16. Watch the best plays from New York Jets quarterback Sam Darnold Week 16 when he faced the Green Bay Packers.